Today I had the good fortune to be invited to attend the United Airlines Family Day event at San Francisco International Airport. They had a number of exhibits, games for kids, food and entertainment. But what was most relevant to my ham radio hobby was a display of the SFO Fire department’s Mobile Command truck. It caught my eye from a distance, because it was the general size and shape of a large fire engine, but had a tall pneumatic antenna mast raised above. I had to take a tour. 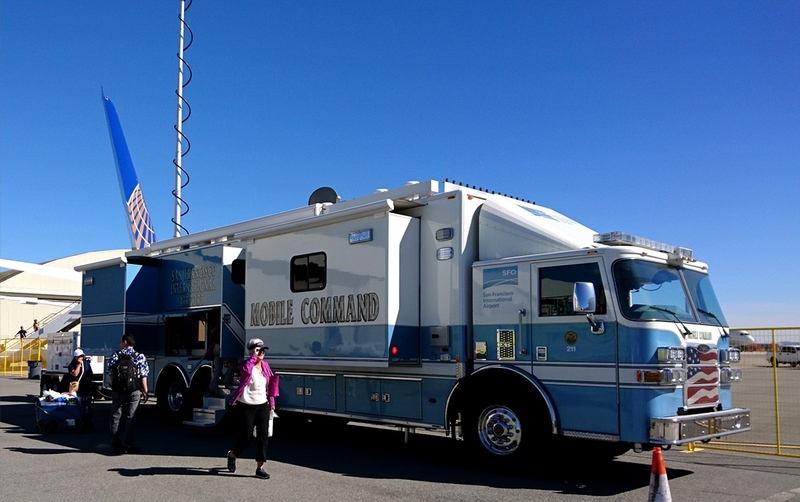 This is set up as a mobile command post for use in the event of a major emergency at the airport. It might be used in a plane crash, a terrorist attack, an earthquake, or whatever. This is intended to be a meeting place, set up close to the situation, where the various decision-makers can determine a plan of action and communicate with those who will be enacting the plan. 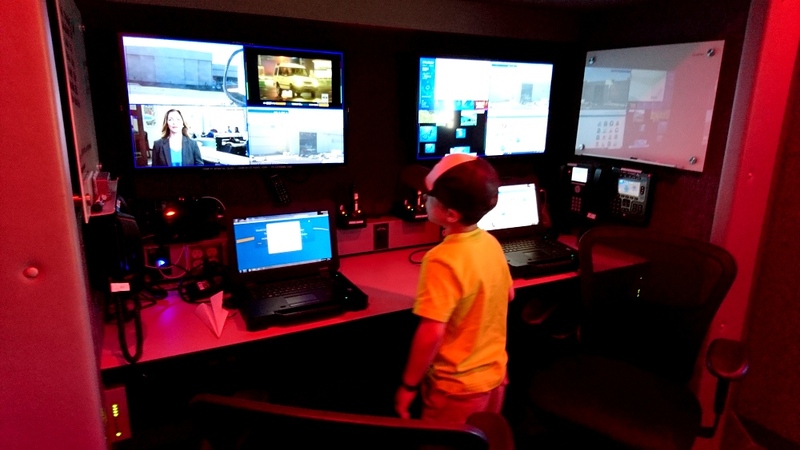 Inside was a beautiful, spacious, state-of-the-art communications center! There were multiple “slide-out” sections, each of which had two communications stations, I’m not sure whether I saw eight or ten total communications stations, but I was impressed! There were also conference tables and equipment racks. 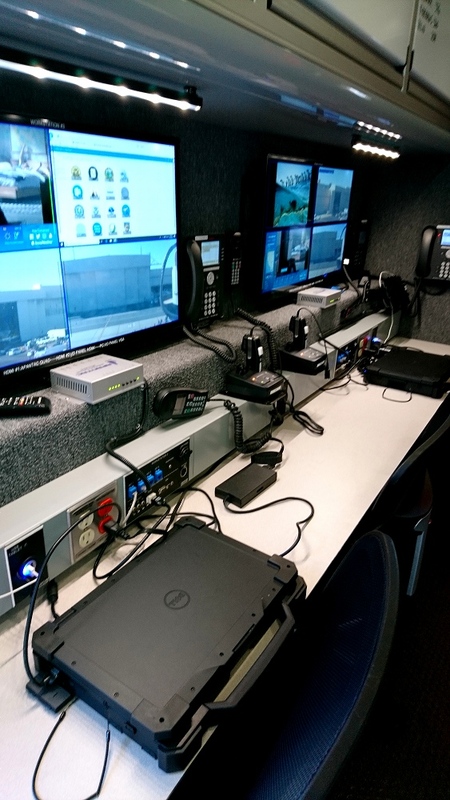 Each communications station had a laptop, some phones, radios, a large video screen, and a whiteboard. The video screen was subdivided into four areas, and each area could watch a different video feed. The truck had satellite and local TV feeds to monitor broadcast media, plus there were two cameras mounted on the top of the antenna mast, to give a live video feed of the situation near the truck. The antenna mast had an the ability to connect directly to the airport’s WiFi system, as long as the truck could get a line of sight to the control tower. As a backup, it had cellular data service and satellite Internet. It’s tempting to compare this to our amateur radio club’s communications van. We are a group of amateurs who use our truck about a dozen times a year to help provide communications for organized bike rides, hikes, races, and similar events, while the San Francisco Airport Fire Department is a group of professionals who must be ready to respond to a major disaster at any time, so it’s not surprising that our communications needs and gear are rather different.